Camila Cabello returned to The Tonight Show Starring Jimmy Fallon on Wednesday to perform her solo smash “Havana” in the style of the show’s “Classroom Instruments” series. 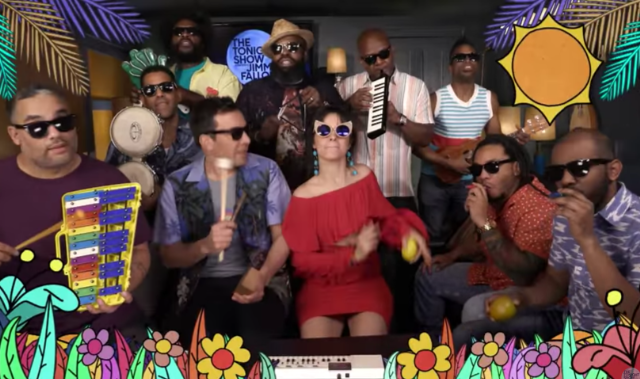 Cabello and The Roots reimagine the track with plastic kazoos, a ukulele, a toy xylophone, and other silly musical contraptions. Honestly, aside from Fallon’s needless background vocals, the gimmick serves the song’s hammy tropical bounce well. Cabello released her debut solo album Camila last Friday. Watch the performance, plus Cabello’s previous visit to the show, when she performed “Havana” with normal instruments, below.